The latest report offers comprehensive analysis of the global Military Deployable Infrastructure market. The key player assesses that this market will generate revenues of US$27,938 Mn in 2019. Read on to discover how you can exploit the future business opportunities emerging in this sector. This new study tells you and tells you NOW. In this brand new report, you find 73 in-depth tables and 90 figures. 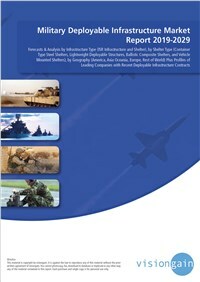 The 187-page report provides clear detailed insight into the global military deployable infrastructure market. Discover the key drivers and challenges affecting the market. Anyone within the Military Deployable Infrastructure value chain.